Set in the heart of Paris, this hotel offers easy access to the historical city center, the Champs-Elysees, Porte Maillot Palais des Congrès, the Opera Garnier and much more. Relax in comfortable guest rooms featuring Wi-Fi, a flat screen TVs and modern amenities. The Skyline Paris Lounge & Bar on the top floor affords breathtaking panoramic views of Paris. 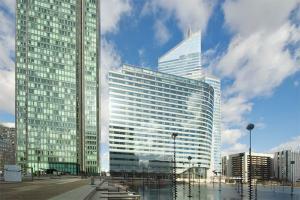 Located in Paris, just 5 minutes from Porte Maillot Congress Centre and 10 minutes from Champs-Elysees.